The people who were standing nearby said, "See how much [Jesus] loved [Lazarus]!" But some said, "This man healed a blind man. Couldn't he have kept Lazarus from dying?" Satan has a way of trying to distort any good thing and corrupt it. 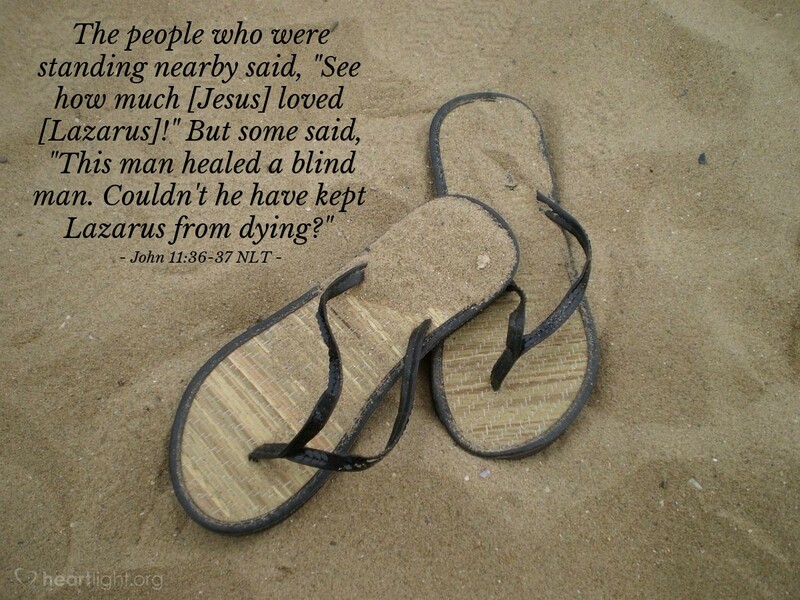 We shouldn't be surprised that he would try to distort Jesus' genuine love for Lazarus by casting doubt on why he was so late in coming to help Lazarus: "He could heal folks, so why didn't he heal Lazarus? He could have stopped all this pain, so why didn't he?" The evil one also causes us to ask those questions about the Lord's intentions for us as well. Satan stirs our mind with doubts, trying to make us doubt the Lord's love for us. But we won't let Satan steal God's love for us in our moments of shock, sorrow, and loss. We know the Lord is there and cares for us. He demonstrated that when he suffered and died for us. So while we may not have the answer to our "Why?" question, we don't let that keep us from the right answer to the "Who?" question. Jesus is our answer! Jesus is our hope! We know he is because he demonstrated his love for us and nothing can rob the nails of Calvary from God's triumphant message to us: "I have a never-ending love for you!" Holy Father, please give me the wisdom to discern the false and deceptive voice of Satan as he seeks to work discouragement and doubt in me through the confusing and hurtful times of my life. Hold my heart with the love your Son showed me at Calvary. In Jesus' name, I pray. Amen.